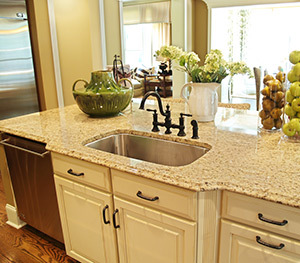 Did you know that adding cabinet hardware could actually improve the look and durability of your kitchen cabinets? It’s true! Adding a knob to your kitchen cabinet can reduce the number of times people slam it open and shut. 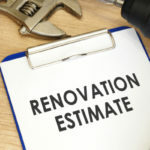 Plus, since cabinets are often opened while cooking and cleaning, oils and other substances will be transferred to the cabinet hardware instead of your cabinets themselves. Durable and sophisticated, cabinet hardware offers unique style to your kitchen, as cabinet hardware comes in great variety of materials, colors, and overall styles. Enjoy rustic, fancy, classic, or intricately detailed knobs—you can even mix and match your hardware, using crystal knobs on some cabinets and porcelain handles on others, the options are endless! All of this variety can start to feel overwhelming; here we provide the basics about cabinet hardware, including types of hardware and materials used. Cabinet knobs can be big or small, hung on by one screw or two. Here are some of the most popular knob designs for cabinets. As the most popular and well-known hardware for cabinets, the knob attaches with one screw and is literally, a knob! Knobs can be decoratively shaped like starfish or kept simple in design using plain sterling silver. This type of hardware knob for cabinets can look like an upside down bathtub to the overly active imagination. Specifically designed to open drawers, some people also use this more intricate handle on their cabinets too. Attached by 2 sets of screws, the cabinet pull has a wider handle for added convenience when tugging open your cabinets and drawers. This type of hardware is often bulkier than other options, typically ranging between 3-4 inches long. Drawer pulls are attached using 2 or more screws and can be very ornate or kept simple. At first glance this type of hardware might remind you of something on a nice dresser. It is attached by 2 or more screws and contains a decorative loop handle that can really dress up your kitchen cabinets and/or drawers. This is a common hardware piece for kitchen appliances such as the trash compacter, dishwasher, or fridge. Large and in charge, these handles are made to withstand a lot of use. Stainless steel, solid brass, stain nickel, the options are endless when it comes to cabinet hardware — so which is the best material for your kitchen? Brushed nickel finish includes dulling brass and then applying a nickel-plating on top. Brushed nickel hardware tends to have visible abrasion lines due to being “wire brushed.” This hardware material provides a more dull appearance. Satin nickel is similar to brushed nickel, but the finished product is a smooth and shinny surface without the abrasion lines brushed hardware contains. Satin Nickel goes on much smoother because it is electro-deposited using Nickel Sulfamate, or some type of nickel salt solution. 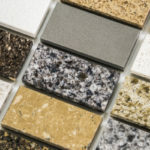 Don’t allow these options to curb your creativity; you can get hardware handles for your kitchen cabinets in a number of other materials including crystal, gold, or PVC. 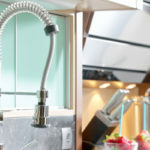 As you do things around the kitchen you likely pop open cabinets without first washing your hands, over time this creates a buildup on hardware that should be cleaned regularly. If you remove your hardware with a screwdriver you will find a lot of built up scum and grim in unseen areas. For water-safe knobs, soak in a bucket of warm soapy water, and then scrub at stubborn stains using a toothbrush or similar tool. If your hardware is metal, apply metal polish with a soft cloth for extra shine. 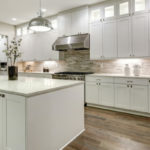 In order to protect materials such as wood, glass, or porcelain make sure kitchen cabinet knobs are completely dry before re-screwing them into place.